Two magicians from the Bronx to Paris, tip toeing on the edge of absurdity. Enforcing laughter through the power of silence. 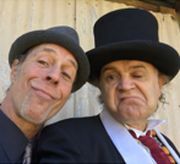 With over 75 years of performing mastery, resulting in a rare and unusual magical combat to the finish, this could only be, the return of … The Mouth Brothers: Arsene Dupin together with Magical Mystical Michael.